The Armistice of Salonica (also known as the Armistice of Thessalonica) was signed on 29 September 1918 between Bulgaria and the Allied Powers in Thessaloniki. The convention followed after a request by the Bulgarian government on 24 September asking for a ceasefire. The armistice effectively ended Bulgaria’s participation in World War I on the side of the Central Powers and came into effect on the Bulgarian front at noon on 30 September. The armistice regulated the demobilization and disarmament of the Bulgarian armed forces. 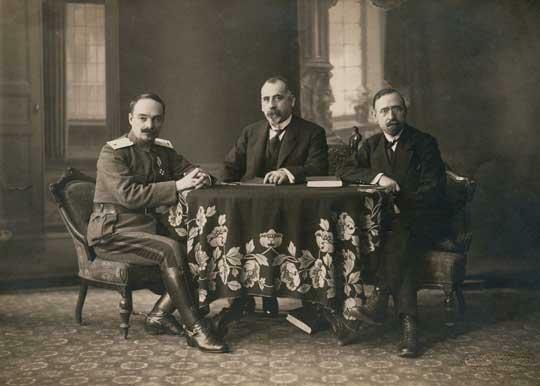 The signatories were, for the Allies, the French General Louis Franchet d’Espérey, commander of the Allied Army of the Orient, and a commission appointed by the Bulgarian government, composed of General Ivan Lukov (member of the Bulgarian Army HQ), Andrey Lyapchev (cabinet member) and Simeon Radev (diplomat). The terms of the armistice called for the immediate demobilization of all Bulgarian military activities. It ordered the evacuation of Bulgarian-occupied Greek and Serbian territories, placed limits and restrictions to the size of Bulgaria’s military employment and required Bulgaria to return military equipment that had been taken from the Greek Fourth Army Corps during the Bulgarian occupation of Eastern Macedonia in 1916. German and Austrian-Hungarian troops had to leave Bulgaria within 4 weeks. Bulgaria and especially Sofia were not to be occupied, but the Allies had the right to temporarily occupy some strategic points and to transfer troops over Bulgarian territory.